Employee training is a key component of any safety program. 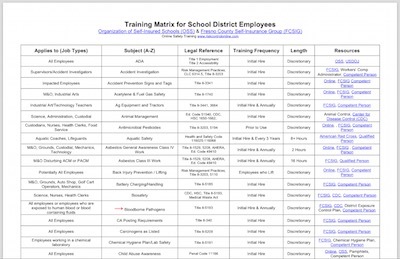 The school employee training matrix provides guidance for supervisors to identify employee training requirements. If employees have duties that are potentially hazardous, supervisors must ensure that appropriate information has been provided. Any time the duties, equipment and/or processes change the employee must receive updated training. Training must be documented and records must be kept for a minimum of three years. The matrix may not include every training topic needed or required. To request training services (online, in-person or video/DVD), please contact us.